Dr. Dees completed her internship and residency in internal medicine at the Brigham and Women’s Hospital in Boston and her medical oncology fellowship training at the Johns Hopkins Oncology Center where she worked with the Phase I trials group and the breast cancer program. She has a master’s degree in clinical trials research. She has been a member of the faculty at UNC since 1999. 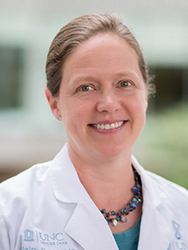 She is a practicing medical oncologist, an active member of the UNC Breast Center, and the founding chair of the Developmental Therapeutics (Phase I trials) Working Group at UNC. She is the co-leader of the Clinical Research Program at UNC Lineberger. Dr. Dees’ research focuses on breast cancer and novel therapeutics. She is also interested in studying inter-individual differences in chemotherapy associated toxicity. She is currently the lead investigator or co-investigator for a number of early phase clinical trials of new anti-cancer drugs and combinations for the treatment of patients with refractory solid tumors. She is also the principal investigator for several clinical trials of treatments specifically for early stage and metastatic breast cancer. She is the UNC principal investigator for our Experimental Therapeutics Clinical Trials Network consortium (with Duke and Wash U). She is the principal investigator for the cooperative group NRG at UNC and is a member of the Pharmacology and Pharmacogenomics committee of the cooperative group ALLIANCE. She has been awarded a Patient Oriented Research Career Development Award from the NIH, and R21 grant, foundation grants, and numerous clinical trials contracts. She has authored or co-authored more than 75 articles.